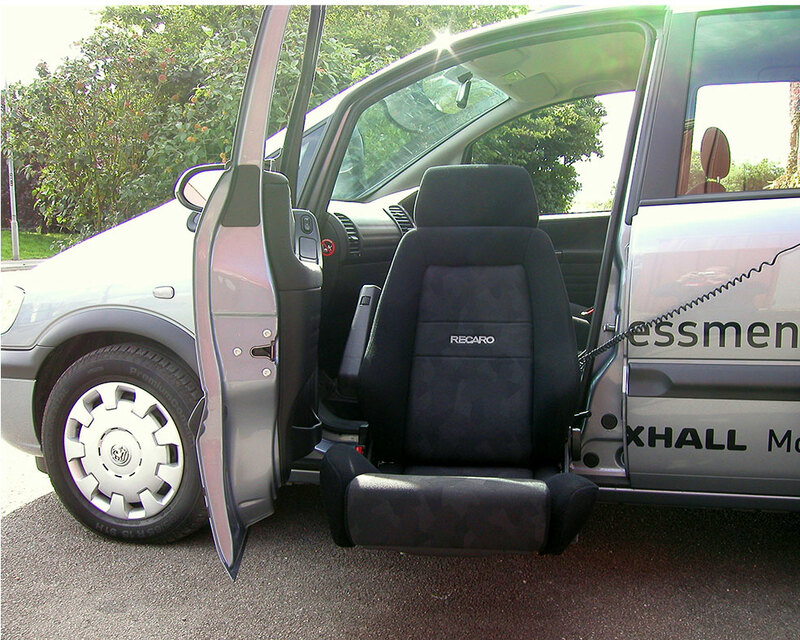 Seat Adaptations provide easier access to vehicles, easier seat manoeuvrability or simply more room for the occupant. The Elap Rotating Car Seat has an ingenious pivot that allows the seat to swing around out and beyond the doorway where it is readily accessible. 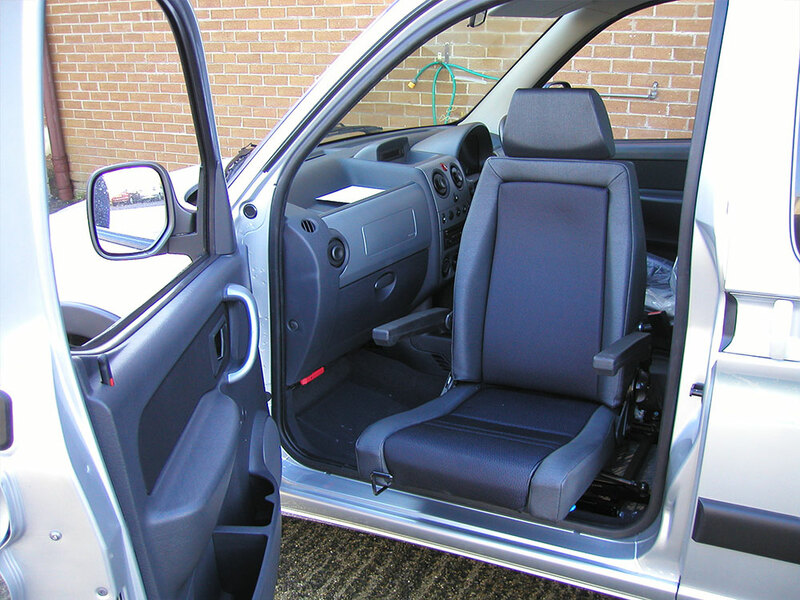 With the occupant seated the seat can be swung back into the normal position so that the body does not need to be twisted in order to get one’s legs into the car. Please contact us to check the compatibility of your vehicle. 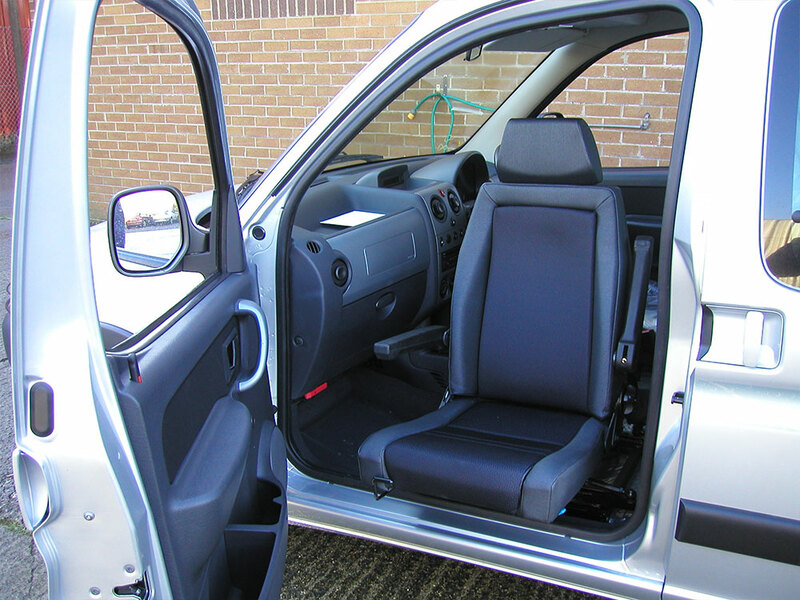 The Turnout and Turny range of swivel seats offer a large variety of options to assist with accessing your vehicle. From the Turnout’s manual swivel to the Turny Evo with complete programmed electrical operation of the swivel as well as the raising and lowering mechanism – suitable for SUV’s and 4x4’s - there is an option available to suit most requirements. A low-level seat such as the BEV or Compact is recommended for use with all Turnout and Turny seats. Your vehicle can be easily checked for compatibility for any of the seat options. The Carony System provides a unique, easily operated transport wheelchair for those who cannot wheel themselves. It eliminates lifting the passenger and simplifies transfer to and from the vehicle. It comprises a wheel unit and a comfortable chair that is used both inside and outside the vehicle. A couple of simple manual operations move the chair and the passenger from the wheel unit to the passenger seat, with the wheel unit being stored in the boot when not in use. Carony can be used as a regular wheelchair. The seat is designed for comfort and has a large variety of accessories for various needs and functions. The effort of moving car seats up and down and backwards and forwards can be very tiring – even before you embark on your journey! By installing an electric motor for either Fore/Aft or Raise/Lower the experience is made almost effortless. 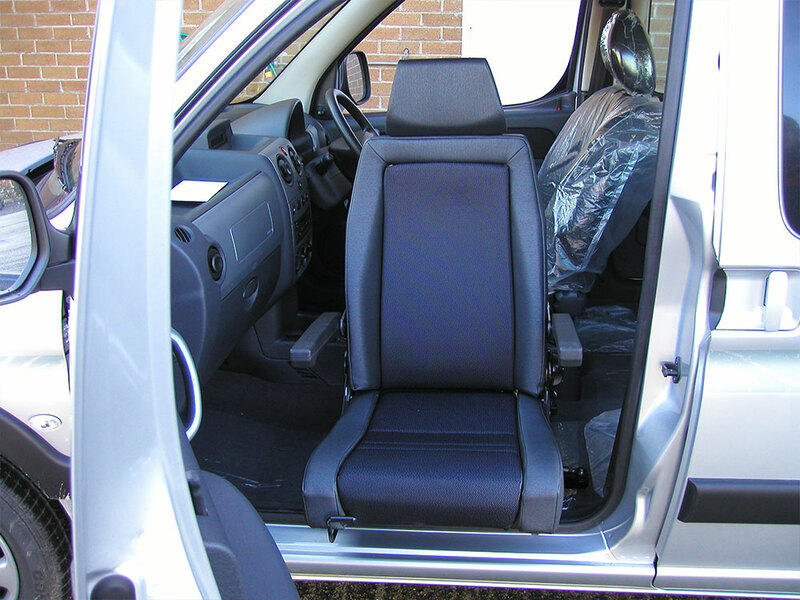 For tall people or those with restricted leg movement the seat can be relocated to provide more legroom for a comfortable travelling position in the driver or passenger side of most vehicles. There is a wide range of adaptations available to assist motorists to access their vehicles. The Person Hoist has been specially designed for lifting people from their wheelchair into a car and out again. 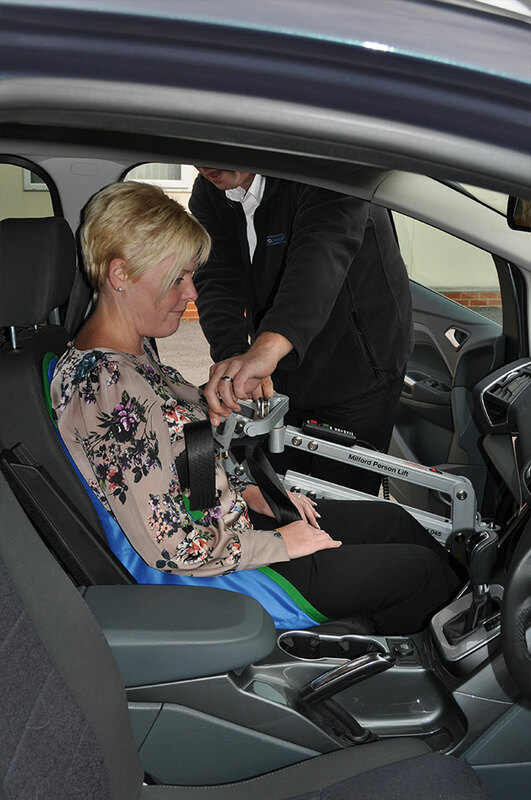 Three separate pivoting points along the lifting arm allows the person being lifted to easily be manoeuvred into the car. The lifting arm is then simply removed and stored. The Person Hoist is suitable for 2 or 4 door cars and power is supplied by the car’s 12-volt battery. The mounting post is the only fixture to the vehicle; it can be removed and transferred to the next vehicle. There is a range of sling sizes, and the Person Hoist is available in two weight capacities – up to 17.5 stones and up to 23.5 stones. Inboard Wheelchair & Occupant Tail Lifts accommodate most wheelchairs and scooters and have a rated load capacity of 800lbs. Available in a range of sizes they are suitable to be fitted to side and rear door openings. As Accredited Ricon Agents; SVO are able to undertake servicing and weight tests on all Ricon lifts. The Transfer Plate helps you make a sideways transfer between a wheelchair and car seat in either the driver or passenger position, by providing a sturdy support between the two. The manual version has a removable plate, which can be stowed when not in use. An electric version is also available, which has the added feature of an up/down movement to assist with standing. The Handy Bar fits the majority of vehicles with a “U” shaped striker. 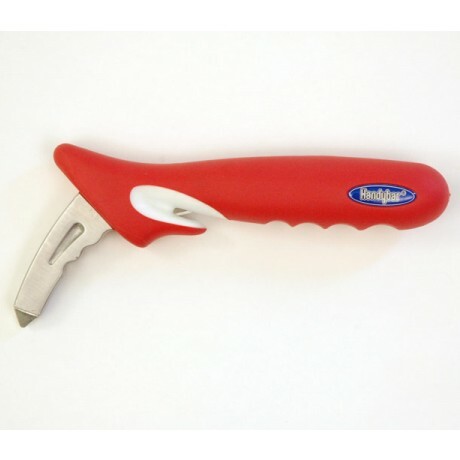 The Handy Bar also incorporates a Seat Belt Cutter and Glass Breaker to assist in the event of an accident. Side Steps can make access into higher vehicles much easier. Available in electric or manual options the step retracts under the vehicle and can be deployed quickly to facilitate entry and exit to the vehicle. 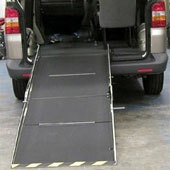 Access Ramps are available in a wide range of options for wheelchair and occupant use. A crucial factor in the transport of people in wheelchairs is their safety. Automatic Wheelchair Restraints are safe and simple to use in conjunction with most manual or powered wheelchairs, with most chairs requiring minor modification. The restraint automatically locks when the chair is rolled into the docking point and prevents the chair from moving whilst tied down. The chair is simply released with a press of the release button. Tracking is essential when transporting people in their wheelchairs in the back of wheelchair accessible vehicles so that the chair is securely fastened to the floor. Tracking systems can be installed to suit individual requirements, for use with extra seating, wheelchair restraints, seat belt systems etc.